Discover what 4-H has to offer! A fun, hands-on workshop for kids! Check out the fun-filled sessions for youth in 3rd-8th grade. Special session for 4-H Cloverbuds (5K-2nd Grade)! Register by February 11. Sign-up early! Class sizes are limited. Explore a variety of exciting 4-H Projects! Try something new in 2019! Forestry Rabbits Cats & Small Pets AND MORE! Invite a friend! — You do not have to be in 4-H to attend. If you have any questions, please feel free to contact the Extension Office at 647-6148. Raising a Thinking Child classes are here! Do you want your child to succeed in school, make friends, and treat others with respect? 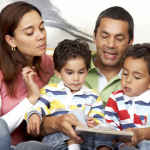 “Raising a Thinking Child” helps you teach young children how to solve problems and resolve daily conflicts. Join us for classes on Tuesday or Thursday evenings!